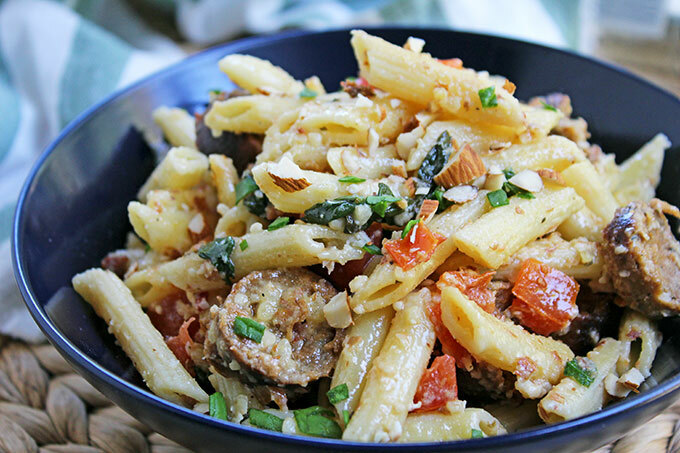 Vegan Italian Sausage Almond Pasta with fresh spinach, tomatoes, lemon, and crushed almonds is a great weekday meal that is ready in 35 minutes. 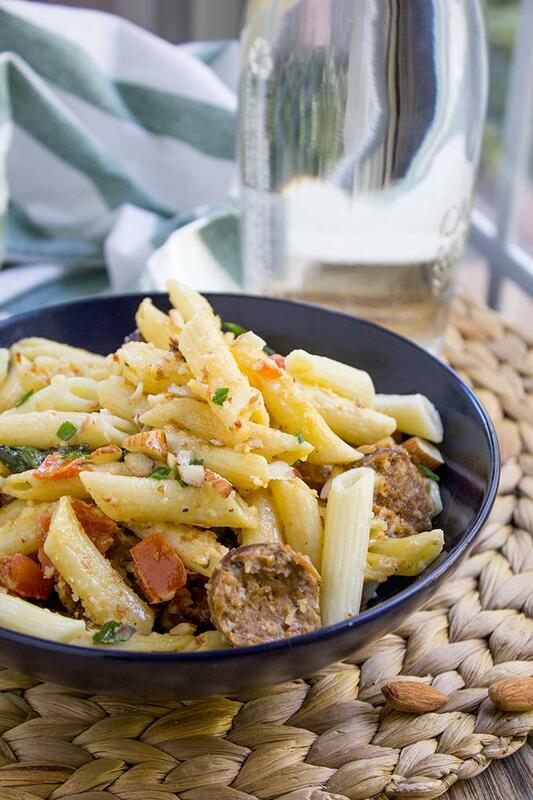 Vegan Italian Sausage Almond Pasta with fresh spinach, tomatoes, lemon, and crushed almonds is a great weekday meal that is ready in 35 minutes. Each bite is full of zesty spices that bring back some fond memories. I remember going to Italian restaurants as a kid. I was impressed by the atmosphere. A dimly lit room with widely spaced candle-lit tables made it seem as if clandestine meetings were being held by the patrons. The soft murmur of their voices blending with the croons of Frank Sinatra. 8 by 10 framed photos of famous Italian movie and music stars in the background giving the place an old-timey feel. or like I was on a movie set. These and the heady aroma of baked bread, roasted garlic, and sausage-laden pasta always made my mouth water. This nostalgia prompted me to try and create a vegetarian version for my friends and family to enjoy. I bet the carnivores among them won’t even be able to tell the difference. When all the flavors come together so well it is sometimes hard to remember I’m not eating meat. The addition of Tofurkey Italian Sausages with sun dried tomatoes and basil kick it up another notch. You can use the sausage in so many recipes too. What recipes do you use it in? After taste testing several store bought brands, I settled on Tofurkey as the best in its approximation and consistency to the meat sausage I remember. I rarely go for seconds, but I did with the Vegan Italian Sausage Almond Pasta. So many layers of flavor here. The hint of spice from the sausage and herbs, sweetness from the almond, and the tartness from the tomatoes made this too good not to have twice. My taste tester, my brother the omnivore, gave this recipe a thumbs up. While I write this blog post, I’m listening to some obscure Italian punk: Guglielmo – Un’avventura (1982). Music sets the mood and pace when I cook and when I write. You can check it out on Youtube. Do you guys listen to music while you cook too? 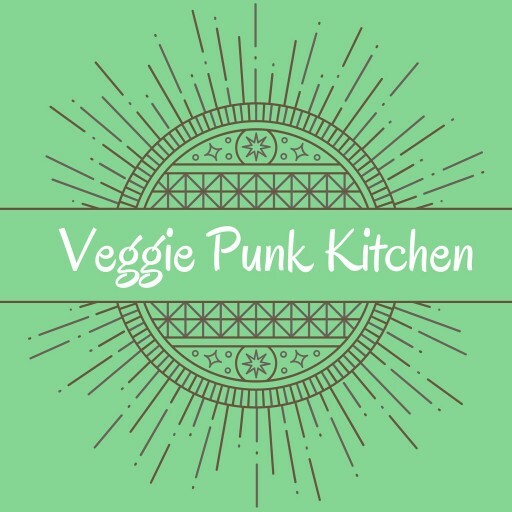 I try to find upbeat, poppy sort of punk for cooking like Social Distortion, Agent Orange, or the Vandals. Vegan Italian Sausage Almond Pasta with fresh spinach, tomatoes and crushed almonds that's ready in 30 minutes. ½ cup almonds - soak in water for 30 minutes then blend to paste. 1 lemon - juice & zest. Add sausage at medium heat, stir frequently for 5 mins. Add salt (if needed), black pepper, and red pepper flakes.